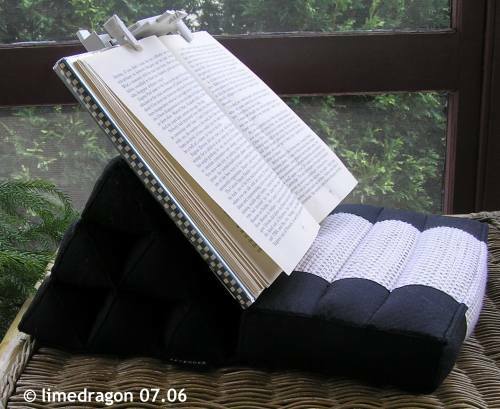 Everything about the BookGem seemed to be what I was looking for in a hands-free book holder: it was small (5.5″ x 2.5″) and reasonably priced ($14.95). This stand was supposed to hold fat paperbacks and hardcovers and also provide the reader with two different angles for reading. The pictures on the website show a black BookGem with green accent, which isn’t available. Instead, they offer cream/gray-colored BookGems. The BookGem website provides good instructions for use, and it does not matter whether the reader orients the holder at the bottom of the book or at the top. It works both ways and also provides the user with different reading angles. The page clips are spring-loaded, but the spring is very strong! Some force is needed to manipulate the page clips and they can catch fingers easily if not careful. I liked the little notches on the page clips. 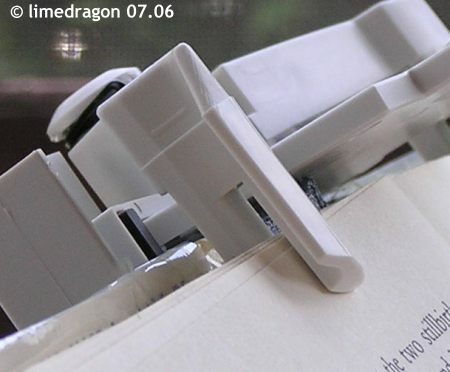 They provide enough space to hold about 20-30 pages, preventing the need to constantly free a page from the page clip. The first time I tried it, I forgot to flip open the ledge and noticed that the book did not line up with these notches. The pages would not lay flat. Once I figured out the ledge, the book lined up correctly and the pages were fine. These page notches save some time, but I noticed when starting or ending a book, I needed to rub my finger firmly up/down the center to help tame the pages. Click to open manual slideshow. I tested it with 400-page paperbacks, and the BookGem held onto the book fairly well. I tried shaking it, and only once did the book slip out of the holder. Next, I tried hardcovers. I could not use it with Eldest; it was too big (~700 pages). I had better luck with smaller 200-300 page hardcover books. When I had extra room in my knitting bag, I was able to leave the book open in the BookGem and and slip it into the bag. This saved me time by eliminating the need to setup the book every time I wanted to read. In this situation, the holder also acted as a bookmark by keeping my place in the book. I tested this book holder while in the car (as a passenger). I found that the book/holder combo could tip over with the frequent stops and turns caused by driving/riding in city streets. On the highway, the ride was smoother, and there were no tip-overs. I haven’t tried it yet with airplane or train travel, but I would expect similar results. The only problem I found with the BookGem is that it will flatten the book. 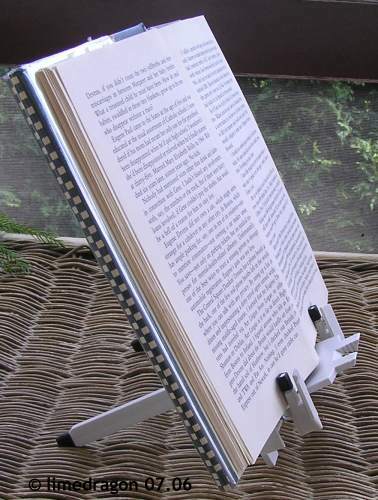 This may not be to some people’s liking; if you prefer to keep the spines of your books as straight or crease-free as possible, then you wouldn’t want to use this book holder. Although the BookGem did not work with thicker hardcovers, I was satisfied overall with my experience. Sometimes I combined it with my Thai Book Rest on my lap, and this was more comfortable and stable. So, now I have to wait for the next review to hear which you liked best? Hi, I got your guesses in my destash yarn contest…thanks! Have you reviewed nighttime reading lights? I had a favorite that died and I haven’t yet replaced it. DH is disturbed by the light, so this worked well. It was a cheap camping headlamp that had a red light/night vision setting. Of course, me screaching “Roxanne…put on the red light…” nearly every time I put the headlamp didn’t do so much for his getting to sleep.